The London and South Western Railway (LSWR) was a railway company in England from 1838 to 1922. Starting as the London and Southampton Railway, its network extended from London to Plymouth via Salisbury and Exeter, with branches to Ilfracombe and Padstow and via Southampton to Bournemouth and Weymouth. It also had many routes connecting towns in Hampshire and Berkshire, including Portsmouth and Reading. In the grouping of railways in 1923 the LSWR amalgamated with other railways to create the Southern Railway. Among significant achievements of the LSWR were the electrification of suburban lines, the introduction of power signalling, the development of Southampton Docks, the rebuilding of Waterloo Station as one of the great stations of the world, and the handling of the massive traffic involved in the First World War. Spreading car ownership led to a rapid decline of passenger traffic in Devon and Cornwall from about 1960 to the end of that decade so short mid-distance-from-London branches and the remote peninsular sections of route closed under the Beeching Report, except the line to Penzance from Exeter which had since the very outset been the main preserve of the Great Western Railway, chiefly due to that company's initial laying of track there and doing so on broad gauge and encouraging Devon and Cornish companies to do so under the 'Gauge War'. 7.2 More widening, and renaming to "Waterloo"
The London and South Western Railway originated as a renaming of the London and Southampton Railway, which opened in May 1840 to connect the port of Southampton with London. Its original London terminus was Nine Elms, on the south bank of the river Thames, the route being laid through Wimbledon, Surbiton, Woking, Basingstoke and Winchester, using what became the standard track gauge of 4 ft 8 1⁄2 in (1,435 mm). The Great Western Railway secured access early on to Exeter and Plymouth through its allied companies, and the LSWR aspired to build its own competing route to reach Devon and Cornwall, which would offer considerable traffic potential. It made a slow start but eventually had its own line from Basingstoke to Salisbury and Exeter, continuing by a northerly arc to Plymouth, and to north Devon and north Cornwall. Coming later than the Great Western to the area, it never achieved the solid prosperity there of its broad gauge neighbour. The Southampton line had been extended to Weymouth via Ringwood, and the LSWR consolidated its home area building branches closer to London, and direct lines to Portsmouth, and to Reading. It also became joint owner, with the Midland Railway, of the Somerset and Dorset Railway, responsible for infrastructure and coaching stock on the latterly famous route. Shipping became significant also, with passenger and freight services to the Channel Islands, to Saint-Malo in France, and to the Isle of Wight. In the twentieth century, it embarked on a programme of electrifying the suburban routes, at 600 V DC using a third rail. Eventually this covered the entire suburban area. Freight traffic, especially from the West Country was important, but the emphasis on suburban electrification led to weaker development of steam traction for fast passenger and goods services to Devon and Cornwall, and to Portsmouth, Bournemouth and Weymouth. At the grouping of the railways, the LSWR amalgamated with other railways to create the Southern Railway, and the independent Isle of Wight railways were absorbed, becoming part of the former LSWR section within the Southern Railway. Its enlightened and unorthodox Chief Mechanical Engineer, Oliver Bulleid, put in hand the construction of a fleet of powerful express steam locomotives, the Merchant Navy class, followed by a larger fleet of so-called light pacifics, built with lighter axle loading to give access to branch lines with weaker track and bridge strengths; this enabled radical improvements to main line passenger services, and the streamlined profile of the new fleet made an impact as a modern design, and it remained an iconic image. At the same time they revolutionised express passenger train speeds to Weymouth and the West Country, although their technical innovation incorporated a number of difficulties. Electrification of the Portsmouth line was now carried out. Capital infrastructure works were also undertaken, including the Feltham marshalling yard, major improvements to Southampton Docks and Waterloo station, a new locomotive workshop at Eastleigh, and grade separated junctions on the main line, as well as signalling modernisation schemes. A concrete manufacturing works was established at Exmouth Junction (Exeter) producing standardised pre-cast components such as platform units, lamp posts and platelayers' huts; the designs became familiar throughout Southern Railway territory. Nationalisation of the railways in 1948 brought relatively little immediate change to the former LSWR system, now part of the Southern Operating Area of British Railways, later the Southern Region, although national centralisation of locomotive design made Bulleid's position untenable and he retired. However, in 1966 the geographical limits of the British Railways regions was rationalised, and the Devon and Cornwall lines were transferred to the Western Region. Many of the branch lines had declined in traffic in the 1950s and were considered uneconomic, and following the Beeching Report, the Reshaping of British Railways, many of the branches were closed, as was the Plymouth main line. The Bournemouth line was electrified in 1967, at first with converted steam coaching stock, later replaced by purpose built stock; the electrification was extended to Weymouth. In recent years the system has remained constant, with gradually increasing train frequency from about 1990 now forming a limitation. When international train services from London to Paris and Brussels were initiated in 1994, they required space for very long trains, and this was provided at Waterloo: the Eurostar terminal was built on the north side of the station with the international trains using the first three miles (4.8 kilometres) of the LSWR main line before diverging. The services were transferred to St Pancras International in 2007 and at present (2017) the Eurostar terminal, having sat dormant for a decade, is being developed for re-opening and use by Windsor & Reading services. The London and South Western Railway arose out of the London and Southampton Railway (L&SR), which was promoted to connect Southampton to the capital; the Company envisaged a considerable reduction in the price of coal and agricultural necessities to places served, as well as imported produce through Southampton Docks, and passenger traffic. Construction probably started on 6 October 1834 under Francis Giles, but progress was slow. Joseph Locke was brought in as engineer, and the rate of construction improved; the first part of the line opened to the public between Nine Elms and Woking Common on 21 May 1838, and it was opened throughout on 11 May 1840. The terminals were at Nine Elms, south of the River Thames and a mile or so south west of Trafalgar Square, and a terminal station at Southampton close to the docks, which were also directly served by goods trains. The railway was immediately successful, and road coaches from points further west altered their routes so as to connect with the new railway at convenient interchange points, although goods traffic was slower to develop. The London and Southampton Railway promoters had intended to build a branch from Basingstoke to Bristol, but this proposal was rejected by Parliament in favour of the competing Great Western Railway route. The Parliamentary fight had been bitter, and a combination of resentment and the commercial attraction of expanding westwards remained in the Company's thoughts. A more immediate opportunity was taken up, of serving Portsmouth by a branch line. Interests friendly to the L&SR promoted a Portsmouth Junction Railway, which would have run from Bishopstoke (Eastleigh) via Botley and Fareham to Portsmouth. However resentment in Portsmouth—which considered Southampton a rival port—at being given simply as branch and thereby a roundabout route to London, killed the prospects of such a line. Portsmouth people wanted their own direct line, but in trying to play off the L&SR against the London & Brighton Railway they were unable to secure the committed funds they needed. The L&SR now promoted a cheaper line to Gosport, shorter and simpler than the earlier proposal. Approval had recently been given for the construction of a floating bridge, i.e. a vehicle chain ferry, giving connection between Gosport and Portsmouth, and the L&SR secured its Act of Parliament on 4 June 1839. To soothe feelings in Portsmouth, the L&SR included in its Bill a change of name to the London and South Western Railway under Section 2. Construction of the Gosport branch was at first quick and simple under Thomas Brassey. Stations were built at Bishopstoke (the new junction station; later renamed Eastleigh) and Fareham. An extremely elaborate station was built at Gosport, tendered at £10,980, seven times the tender price for Bishopstoke. However, there was a tunnel at Fareham, and on 15 July 1841 there was a disastrous earth slip at the north end. Opening of the line had been advertised for 11 days later, but the setback forced a delay until 29 November; the ground slipped again four days later, and passenger services were suspended until 7 February 1842. Isle of Wight ferry operators altered some sailings to leave from Gosport instead of Portsmouth. Queen Victoria was fond of travelling to Osborne House on the island, and on 13 September 1845 a 600-yard (550-metre) branch to the Royal Clarence Victualling Establishment was opened for her convenience. Between the first proposal for a railway from London to Southampton and the construction, interested parties were considering rail connections to other, more distant, towns that might be served by extensions of the railway. Reaching Bath and Bristol via Newbury was an early objective. The Great Western Railway (GWR) also planned to reach Bath and Bristol, and it obtained its Act of Parliament on 31 August 1835, which for the time being removed those cities from the LSWR's immediate plans. There remained much attractive territory in the South West, the West of England, and even the West Midlands, and the LSWR and its allies continually fought the GWR and its allies to be the first to build a line in a new area. The GWR was built on the broad gauge of 7 ft 1⁄4 in or 2,140 mm while the LSWR gauge was standard gauge (4 ft 8 1⁄2 in or 1,435 mm), and the allegiance of any proposed independent railway was made clear by its intended gauge. The gauge was generally specified in the authorising Act of Parliament, and bitter and protracted competition took place to secure authorisation for new lines of the preferred gauge, and to bring about parliamentary rejection of proposals from the rival faction. This rivalry between the GWR and the standard gauge companies became called the gauge wars. In the early days Government held that several competing railways could not be sustained in any particular area of the country, and a commission of experts referred to informally as the "Five Kings" was established by the Board of Trade to determine the preferred development, and therefore the preferred company, in certain districts, and this was formalised in the Railway Regulation Act 1844. When the first main line opened, the LSWR built a station called Kingston, somewhat to the east of the present-day Surbiton station and this quickly attracted business travel from residents of Kingston upon Thames. The availability of fast travel into London encouraged new housing development close to the new station. Residents of Richmond observed the popularity of this facility, and promoted a railway from their town to Waterloo; it opened in July 1846 and became part of the LSWR later that year. Already a suburban network was developing, and this gathered pace in the following decades. Branches off the main line were made to Chertsey in 1848 and Hampton Court in 1851, while the Richmond line was extended, reaching Windsor in 1851, while a loop line from Barnes via Hounslow rejoining the Windsor/Staines line near Feltham had been opened in 1850. In 1856 a friendly company, the Staines, Wokingham and Woking Junction Railway, opened its line from Staines to Wokingham, and running powers over the line shared by the South Eastern Railway and the Great Western Railway gave access for LSWR trains over the remaining few miles from Wokingham to Reading. South of the main line, the important towns of Epsom and Leatherhead needed to be served; the rival London, Brighton and South Coast Railway (LB&SCR) reached Epsom first (from Sutton), but in 1859 the LSWR opened a line from Wimbledon, closely paralleling the main line as far as the present-day Raynes Park and then turning south to Epsom. Between Epsom and Leatherhead a joint line with the LB&SCR was built, also opening in 1859. Parts of Kingston were three miles (4.8 kilometres)from Surbiton station and in 1863 the town got its own terminal station, reached westward via Teddington. A single-track branch was laid in 1864 to reach westwards up the Thames Valley to Shepperton. In 1869 the Kingston line was formed into a loop by the extension from Kingston to Malden. The daily inconvenience of the LSWR London terminal at Waterloo, close to Whitehall via Westminster Bridge but poorly connected at the time to the City of London, became increasingly prominent as daily commuting increased. This was partly alleviated when friendly relations with the LB&SCR and the London, Chatham and Dover Railway (LC&DR) gave access for LSWR trains to its Ludgate Hill (City) station from Wimbledon via Tooting, Streatham and Herne Hill: this service commenced in 1869, and in the same year the LSWR opened a new route from Waterloo to Richmond via Clapham Junction and Kensington (Addison Road) on the West London Extension Railway, over new track through Hammersmith and the present-day Turnham Green and Gunnersbury. Although circuitous, this route swept up considerable inner-suburban business. At the end of the independent life of the LSWR its trains reached, with the help of running powers and friendly companies, to today's suburban destinations. The railway was only convenient for Westminster as to commuters, lacking an underground station, and made strenuous exertions to get direct access for its trains to the City of London, the destination of the majority of business customers in the later decades of the nineteenth century, but in most cases these were circuitous and thus slow. The problem was resolved by the opening of the Waterloo & City Railway in 1898. Quadrupling, grade-separated junctions, and electrification all enhanced the efficiency of the service offered. The London and Southampton Railway promoters had lost the first battle for authorisation to make a line to Bristol, but the objective of opening up the country in the South West and in the West Of England remained prominent. In fact it was an independent promoter, Charles Castleman, a solicitor of Wimborne Minster, who assembled support in the South West, and on 2 February 1844 proposed to the LSWR that a line might be built from Southampton to Dorchester: he was rebuffed by the LSWR, who were looking towards Exeter as their next objective. Castleman went ahead and developed his scheme, but relations between his supporters and the LSWR were extremely tense, and Castleman formed a Southampton and Dorchester Railway, and negotiated with the Great Western Railway instead. The Bristol & Exeter Railway, a broad gauge company allied to the GWR, reached Exeter on 1 May 1844, and the GWR was promoting the Wilts, Somerset and Weymouth Railway which was to connect the GWR to Weymouth. It seemed to the LSWR that on all sides they were losing territory in the Westcountry that they considered rightfully theirs, and they hastily prepared plans for their own lines crossing from Bishopstoke to Taunton. Much was made of the roundabout route of the Southampton and Dorchester line, and it was mockingly referred to as Castleman's corkscrew or the water snake. The Five Kings (referred to above) published their decision, that most of the broad gauge lines should have preference, as well as the Southampton and Dorchester line which was to be built on the narrow gauge. Formal agreement was reached on 16 January 1845 between the LSWR, the GWR and the Southampton & Dorchester, agreeing exclusive areas of influence for future railway construction as between the parties. The Southampton and Dorchester line was authorised on 21 July 1845; there was to be an interchange station at Dorchester to transfer to the broad-gauge WS&W line, which was to be required to lay mixed gauge to Weymouth to give narrow gauge trains from Southampton access. To demonstrate impartiality the Southampton and Dorchester would be required to lay mixed gauge on its line for the same distance east of Dorchester, even though this did not lead to any source of traffic as there were no stations or goods sidings on the dual-gauge section. Interests in Southampton had also forced a clause in the Act requiring the S&DR to build a station at Blechynden Terrace, in central Southampton. This became the present day Southampton Central; the Southampton and Dorchester was to terminate at the original LSWR terminus in Southampton. The line opened on 1 June 1847 from a temporary station at Blechynden Terrace westwards, as the tunnel between there and the LSWR station at Southampton had slipped; that section was finally opened on the night of 5/6 August 1847, for a mail train. Powers were taken for the LSWR to amalgamate with the S&DR, and this took effect on 11 October 1848. The Southampton and Dorchester line ran from Brockenhurst in a northerly sweep through Ringwood and Wimborne, bypassing Bournemouth (which had not yet developed as an important town) and Poole; the port of Poole was served by a spur line to Lower Hamworthy on the opposite side of Holes Bay. It then continued via Wareham to a terminus at Dorchester which was sited to facilitate a further extension in the direction of Exeter. The link to the WS&W line was awkwardly sited, requiring through trains to Weymouth to either reverse in and out of Dorchester station or skip it altogether. While Castleman was developing his Southampton and Dorchester line, the LSWR was planning to reach the important city of Salisbury. This was done by a branch from Bishopstoke by way of Romsey and the Dean Valley. By launching from Bishopstoke, the Company wished to connect the ports of Southampton and Portsmouth with Salisbury, but this made the route to London somewhat circuitous. The necessary Act was obtained on 4 July 1844, but land acquisition delays and inefficient contract arrangements delayed the opening until 27 January 1847, and then only for goods trains; passengers were conveyed from 1 March 1847. The Salisbury station was at Milford, on the east side of the city. Business interests in Andover were disappointed that the Salisbury line was not to pass through their town, and a London Salisbury and Yeovil line, through Andover was being promoted; it might ally with a line from Yeovil to Exeter with a Dorchester branch, forming a new, competing London to Exeter line, so that the LSWR territorial agreement with the GWR would be worthless. When the LSWR indicated that they would themselves build a line from Salisbury to Exeter, the GWR complained bitterly that this broke the 16 January 1845 territorial agreement, and the Southampton and Dorchester complained too that this new line would abstract traffic from them. As the railway mania was now at its height, a frenzy of competing schemes was now proposed. The LSWR itself felt obliged to promote doubtful schemes in self-defence, but by 1848 the financial bubble of the mania had burst, and suddenly railway capital was difficult to find. In that year, only a few more realistic schemes gained Parliamentary authority: the Exeter Yeovil and Dorchester Railway, for a narrow gauge line from Exeter to Yeovil, and the Salisbury and Yeovil Railway. At the end of 1847, work had begun on the LSWR's own line from Basingstoke to Salisbury via Andover, and the scene seemed at last to be set for LSWR trains to reach Exeter. This apparent resolution of the conflict was deceptive, and in the following years a succession of disruptive pressures exerted themselves. The Southampton and Dorchester Railway should be the route to Exeter via Bridport; the GWR and its allies were proposing new schemes intersecting the LSWR's route west; the Wilts Somerset and Weymouth line resumed construction and appeared to threaten the LSWR's future traffic; the Andover and Southampton Canal was to be converted to a broad gauge railway; and residents of towns on the proposed LSWR route were angry at the delay in actually providing the new line. The outcome of all this was that the Salisbury and Yeovil Railway was authorised on 7 August 1854; the LSWR line from Basingstoke resumed construction, and was opened to Andover on 3 July 1854, but it took until 1 May 1857 for the line to open from there to Salisbury (Milford). The LSWR had given undertakings to extend to Exeter and it was compelled to honour these, obtaining the Act on 21 July 1856. The narrative "West of Salisbury" is continued below. The company's first London terminus was at Nine Elms on the south-western edge of the built-up area. The wharf frontage on the river was advantageous to the railway's objective of competing with coastal shipping transits, but the site was inconvenient for passengers, who had to travel on to London either by road or by steamer. The "Metropolitan Extension" to a more central location had been discussed as early as 1836, and a four-track extension to Waterloo Bridge station was authorised by Act of Parliament on 31 July 1845 with a supplementary Act of 1847; the capital authorised was £950,000. The line had an intermediate station at Vauxhall. Opening was planned for 30 June 1848, but the Board of Trade Inspector did not approve some of the large-span bridges at the eastern end, however his superior was satisfied by later load tests, and the line opened on 11 July 1848. At first incoming trains stopped outside the station and were pulled in by capstan after the locomotive had been detached. The Nine Elms site became dedicated to goods traffic and was much extended to fill the triangle of land eastwards to Wandsworth Road. The independent Richmond Railway was promoted, joining the LSWR at Falcon Road (near the present-day Clapham Junction). The LSWR adopted the Richmond line and there were four tracks from Falcon Road to Waterloo Bridge. There were four platforms with six platform faces, about where platforms 9 to 12 are today. They were doubled in length soon after opening. In 1854 the London Necropolis & National Mausoleum Company opened its one-platform station adjacent to Waterloo on the south side between York Street and Westminster Bridge Road. The company arranged for the transport of the dead and the funeral parties, to a burial site near Brookwood, using LSWR locomotives. On 3 August 1860 four additional platforms were opened on the north-west side of the original station, separated from it by a cab road. This became known as the Windsor station[note 2] and served the Windsor line and outer suburban traffic. The LSWR was aware that Waterloo Bridge was still not convenient for the increasing number of business people travelling to the City of London and the Company tried repeatedly to get access independently, but these plans were dropped on the grounds of expense. The Charing Cross Railway (CCR), supported by the South Eastern Railway (SER), opened a line from London Bridge to Charing Cross on 11 January 1864, and was obliged to make a connection from that line to the LSWR Waterloo station. It did so but declined to operate any trains over the connection. The single line connected through the station concourse and ran between platforms 2 and 3; there was a movable bridge across the track. In 1865 a circular service started from Euston via Willesden and Waterloo to London Bridge. The SER was clearly reluctant to encourage this service, and diverted to Cannon Street it struggled on until ceasing on 31 December 1867. A few van shunts, and also the Royal Train, were the only movements over the line after that. By opposing a Parliamentary Bill that was important to the SER, the LSWR got that company's agreement to build a Waterloo station on its Charing Cross line, and this, at first called Waterloo Junction, opened on 1 January 1869; this is the present-day Waterloo East station. More widening, and renaming to "Waterloo"
Further widening in the throat area of the station took place in 1875, and the Necropolis platform was taken for this work, a new platform for them being provided nearer to Westminster Bridge Road. On 16 December 1878 a two-sided platform was added becoming the South station. In November 1885 six more platforms, the North station, for the Staines (Windsor and Reading) lines opened. The original four tracks therefore fed into 16 platforms and between 1886 and 1892 for the course to Surbiton an additional two tracks were added, followed by one more in 1900 and another in 1905 of much shorter distance. In 1886 the station name was changed to Waterloo. A number of independent schemes to reach the City of London were promoted, and in 1893 a Waterloo & City Railway obtained its Act of Parliament, to build a tube railway (then an extremely novel concept) from below Waterloo station to a City station at the Mansion House. This was successfully built, and it opened in 1898, running electric trains at frequent intervals. Through ticketing from LSWR stations were available, and the LSWR worked the line. The City station was later renamed Bank. The incremental expansion of Waterloo station in the nineteenth century had led to a chaotic and difficult terminal installation, and in 1899 the Company obtained powers for a major reconstruction and further expansion of the station; subsequent Acts further extended the powers. A considerable land take was involved, and the Necropolis station had to be moved, again, this time to the west of Westminster Bridge Road, where it opened with two platforms on 16 February 1902; the Waterloo & City Railway station was largely to be built over. The huge task cost £2 million, and was largely implemented in the years 1906-1916, although some work was not complete until 1922. It was only as part of this work that the defunct through line to the SER route was finally removed, authorised by Act of 1911; Westminster Bridge Road bridge was widened to carry 11 tracks. The numbering sequence of platforms was rationalised, and the new platforms 1 to 3 opened, on new ground, on 24 January 1909, followed by platform 4 on 25 July 1909, roughly on the site of the southernmost of the former platforms; platform 5 followed on 6 March 1910. As well as platform accommodation, a new mechanical departure indicator was provided, and there were spacious new offices for the LSWR headquarters. The new roof over platforms 1 to 15 was built, with its bays transverse to the tracks; the roof over what became platforms 16 to 21 retained the longitudinal roof built in 1885, making the Windsor line station obviously different. The last of the new platforms was commissioned on 28 February 1915. The new station was formally opened by HM Queen Mary on 21 March 1922; the cost of the reconstruction had been £2,269,354. After a long period of conflict, the LSWR's route to the West of England was clear; the earlier connection to Milford station at Salisbury from Bishopstoke had been opened on 17 January 1847. 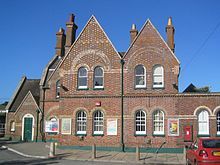 The route from London was shortened by the route from Basingstoke via Andover on 2 May 1859, with a more convenient station at Salisbury Fisherton Street. The conflict had centred around the best route to reach Exeter, and Devon and Cornwall, and this had finally been agreed to be the so-called "central route" via Yeovil. The Salisbury and Yeovil Railway opened its line, from Salisbury to Gillingham on 1 May 1859; from there to Sherborne on 7 May 1860, and finally to Yeovil on 1 June 1860. The controversy over the route to Exeter having been resolved, the LSWR itself had obtained authority to extend from Yeovil to Exeter, and constructing it swiftly, it opened on 19 July 1860 to its Queen Street station there. Local railways towards North Devon had already opened: the Exeter and Crediton Railway opened on 12 May 1851, and the North Devon Railway from Crediton to Bideford opened on 1 August 1854. Both lines were constructed on the broad gauge. The LSWR acquired an interest in these lines in the years in 1862-1863 and then bought them in 1865. The Bristol and Exeter railway had reached Exeter at St Davids station on 1 May 1844 and the South Devon Railway had extended southwards in 1846. The LSWR Queen Street station was high above St Davids station, and a westward extension required the line to descend and cross the other lines. The LSWR built a connecting line that descended to St Davids station by a steep falling gradient at 1 in 37 (2.7%). The authorising Act required the Bristol and Exeter Railway to lay narrow gauge rails as far as Cowley Bridge Junction, a short distance north of St Davids where the North Devon line diverged. Under the terms of this concession, all LSWR passenger trains were required to make calls at St Davids station. LSWR trains to London ran south through St Davids station, while broad gauge trains to London ran northwards. The North Devon line formed a convenient launching point for an independent LSWR line to Plymouth. The LSWR encouraged local interests, and the Devon and Cornwall Railway opened from Coleford Junction to North Tawton on 1 November 1865, and in stages from there to Lidford (later Lydford) on 12 October 1874. The LSWR obtained running powers over the South Devon and Launceston Railway, giving it access to Plymouth over that line. Another nominally independent company, the Plymouth, Devonport and South Western Junction Railway built a line from Lidford to Devonport, and the LSWR leased and operated the line, gaining independent access to Devonport, and its own passenger terminal at Plymouth Friary. The line from Okehampton to Lydford itself provided a good starting point for a branch to Holsworthy, in north-west Devon, and this opened on 20 January 1879, and was extended to Bude in Cornwall on 10 August 1898. The line to Holsworthy itself provided a further starting point for a branch to what became the LSWR's most westerly point at Padstow, 260 miles (420 kilometres) from Waterloo). The line was promoted by the North Cornwall Railway, and opened in stages, finally being completed on 27 March 1899. The topography of the line from Salisbury to Exeter is such that the main line passed by many significant communities. Local communities were disappointed by the omission of their town from railway connection, and, in many cases encouraged by the LSWR, they promoted independent branch lines. These lines were worked, and sooner or later absorbed, by the LSWR, so that in time the main line had a series of connecting branches. Exmouth; this branch opened from Exmouth Junction on 1 May 1861. The London and Southampton Railway main line linked the Hampshire towns of Basingstoke, Winchester and Southampton, and from 1841 Portsmouth was served by a branch line from Bishopstoke (Eastleigh) to the neighbour of Portsmouth (Gosport via ferry). In 1847 the rival LB&SCR opened a true but even longer Portsmouth route via its due south line via Hove to Portsmouth and Southsea. Portsmouth interests were disappointed: their lines to London were indirect, either via Hove or Bishopstoke and so promoted a private venture to build a direct south-west route from the LSWR's station at Guildford – the line became known as the Portsmouth Direct Line. It reached Havant in 1858, sparking a two-year legal, pragmatic and, at times, physical 'battle' between the LB&SCR and the LSWR (who managed the services over the independently owned line). This was resolved by a bypassing omnibus to Hilsea (North Portsmouth) from a ''New Havant' terminus' and from 1859 the line was wholly acquired by the LSWR and LB&SCR admitted practical defeat to its arguably monopolistic obstruction. Meanwhile, in northern Hampshire the company had opened its line to Alton in 1852. Initially this was from a single branch from Farnham, but in 1865 a new fast line from the main line at Brookwood through Aldershot. An independent company, the Alton, Alresford and Winchester Railway Company, had built a line between those places which also opened in 1865, with the LSWR running the trains, which worked through Alton station. In 1884 the LSWR bought out the AA&WR, becoming the full owner of the Alton to Winchester line. In 1863 the company took over the Bishops Waltham Railway Company, which had built the Bishops Waltham branch between that village and the LSWR's Botley station on the Eastleigh to Fareham Line. The branch had not opened at the time that the BWR was taken over, so the LSWR was the first to operate services on the line. In 1866 the LSWR built its short branch from Southampton to Netley to service the newly opened Royal Victoria Military Hospital. A decade later, in 1876 the Portsmouth Direct Line was extended further south to reach Southsea and further west to serve the Naval Dockyard with a new station, Portsmouth Harbour. With all the major towns and cities in Hampshire now connected, the LSWR carried out little new building in the 1880s. A short section of line from the Netley branch to Fareham finally completing the West Coastway Line between Southampton and Brighton in 1889. A 1.25 mile branch from Fratton Station, terminating at East Southsea Station in Portsmouth was opened in 1885 but was never successful and closed in 1914.. For its last few years after 1903 it was worked by rail motors. Hampshire saw a brief but significant burst of new-line building in the 1890s. In 1891 the link was opened between the Southampton main line and the newly built Didcot, Newbury and Southampton Railway (over the Hockley viaduct, the longest in the county). In 1894 a new line from Gosport station to Lee-on-the-Solent was built to take advantage of the growth in tourist traffic to the Isle of Wight. However the most significant new routes came about as the LSWR acted to block its greatest rival, the Great Western Railway from building its own line to Portsmouth from Reading. This blocking action took the form of two lines. The Basingstoke and Alton Light Railway was a minor route- the first in the country to be built under the terms of the 1896 Light Railways Act. The second line was the Meon Valley Railway between Alton and Fareham, built to main-line standards as a second London to Gosport route. The new lines opened in 1901 and 1903 respectively, these being the last lines in Hampshire to be built by the LSWR before the 1923 grouping. The town of Swanage was bypassed by the Dorchester line, and local interests set about securing a branch line. After false starts this was achieved when the Swanage Railway Act got the Royal Assent on 18 July 1881 for a line from Worgret Junction, west of Wareham, with an intermediate station at Corfe Castle. Wareham station had been a simple wayside structure, and a new interchange station was built west of the level crossing for the purposes of the branch. The line opened on 20 May 1885, and the LSWR acquired the line from 25 June 1886. In the early years of the twentieth century electric traction was adopted by a number of urban railways in the United States of America. The London and North Western Railway adopted a four-rail system and started operating electric trains to Richmond over the LSWR from Gunnersbury, and soon the Metropolitan District was doing so as well. In the face of declining suburban passenger income, for some time the LSWR failed to respond, but in 1913 Herbert Walker was appointed Chairman, and he soon implemented an electrification scheme in the LSWR suburban area. A third rail system was used, with a line voltage of 600 V DC. The rolling stock consisted of 84 three-car units, all formed from converted steam stock, and the system was an immediate success when it opened in 1915–1916. In fact, overcrowding was experienced in busy periods and trains were augmented by a number of two-car non driving trailer units from 1919, also converted from steam stock, which were formed between two of the three-car units, forming an eight-car train. All the electric trains provided first and third class accommodation only. The routes electrified were in the inner suburban area—a second stage scheme had been prepared but was frustrated by the First World War—but extended as far as Claygate on the Guildford New Line; this was operated at first as an interchange point, but the section was discontinued as an electrified route when overcrowding nearer London occurred, the electric stock being used there and the Claygate line reverting to steam operation. Concomitant with the electrification, the route between Vauxhall and Nine Elms was widened to eight tracks, and a flyover for the Hampton Court line was constructed, opening for traffic on 4 July 1915. When the company was founded it showed interest in Southampton Docks. The first docks had already been built and the development of the port of Southampton was accelerated by the arrival of the railway. In 1843 the LSWR started running ships from Southampton as the New South Western Steam Navigation Company. Later, the LSWR took over the vessels and in 1892 it bought the docks and continued the rapid development of them. In 1891, the works at Eastleigh, in Hampshire, were opened with the transfer of the carriage and wagon works from Nine Elms in London. The locomotive works were transferred from Nine Elms under Drummond, opening in 1909. Bideford railway station in Devon on the not yet reopened section of the Tarka Line from Barnstaple. The locomotive works were at Nine Elms from 1838 to 1908. Under Drummond they were moved to a new spacious site at Eastleigh in 1909. LSWR carriage looking rather pristine. John Viret Gooch Little information is available although from 1844 dark green with red and white lining, black wheels and red buffer beams seems to have become standard. Passenger classes - Indian red with black panelling inside white. Driving splashers and cylinders lined white. Black wheels, smokebox and chimney. Vermilion buffer beams and buff footplate interior. Goods classes - unlined Indian red. Older engines painted black until 1859. All engines dark chocolate brown with 1-inch (25 mm) black bands edged internally in white and externally by vermillion. Tender sides divided into three panels. Paler chocolate known as purple brown with the same lining. From 1874 the white lining was replaced by yellow ochre and the vermillion by crimson. Umber brown with a 3in black band externally and bright green line internally. Boiler bands black with white edging. Buffer beams vermilion. Smokebox, chimney, frames etc. black. Passenger classes - Pea green with black borders edged with a fine white line. Boiler bands black with a fine white line to either side. Goods classes - holly green with black borders edged by a fine bright green line. Passenger classes - royal green lined in chocolate, triple lined in white, black and white. Boiler bands black lined in white with 3-inch (76 mm) tan stripes to either side. Outside cylinders with black borders and white lining. Smokebox, chimney, exterior frames, tops of splashers, platform etc. black. Inside of the main frames tan. Buffer beams vermilion and cab interiors grained pine. Goods classes - holly green edged in black and lined in light green. Boiler bands black edged in light green. Passenger classes - olive green with Drummond lining. Goods classes holly green with black edging and white lining. Passenger classes - olive green with a black border and white edging. Goods classes - holly green often without lining until 1918. On 11 September 1880, a passenger train collided with a light engine at Nine Elms Locomotive Junction, London due to errors by signalmen and the fireman of the light engine. Seven people were killed. On 6 August 1888, a light engine and a passenger train were in a head-on collision at Hampton Wick station, Middlesex due to a signalman's error. Four people were killed and fifteen were injured. On 1 July 1906, an express passenger train was derailed at Salisbury, Wiltshire due to excessive speed on a curve. Twenty-eight people were killed and eleven were injured. As the London and South Western Railway served Portsmouth, Southampton and Weymouth, it developed a number of shipping routes, operating them with its own vessels. ^ At first called the "City" line/underground railway. ^ This and other designations at Waterloo were not considered separate stations for public purposes, but served to signify the parts of Waterloo station. ^ "Fact file - PortCities Southampton". Plimsoll.org. Retrieved 26 March 2013. ^ "The premier port - PortCities Southampton". Plimsoll.org. Retrieved 26 March 2013. ^ Hall, Stanley (1990). The Railway Detectives. London: Ian Allan. pp. 49–50. ISBN 0 7110 1929 0. ^ Earnshaw, Alan (1991). Trains in Trouble: Vol. 7. Penryn: Atlantic Books. p. 6. ISBN 0-906899-50-8. Williams, R.A. (1968). The London & South Western Railway, volume 1: The Formative Years. Newton Abbot: David & Charles. ISBN 0-7153-4188-X. Williams, R.A. (1973). The London & South Western Railway, volume 2: Growth and Consolidation. Newton Abbot: David & Charles. ISBN 0-7153-5940-1. Faulkner, J.N. ; Williams, R.A. (1988). The LSWR in the Twentieth Century. Newton Abbot: David & Charles. ISBN 0-7153-8927-0. Dendy-Marshall, C. F. (1968). Kidner, R.W. (ed.). A history of the Southern Railway. London: Ian Allan. ISBN 0-7110-0059-X. new ed. Hamilton, E.C. (1956). The South Western Railway: its mechanical history and background, 1838-1922. George Allen & Unwin. 256 p.
Nock, O. S. (1971). The London & South Western Railway. Ian Allan. ISBN 0-7110-0267-3. Whishaw, Francis (1842). The Railways of Great Britain and Ireland Practically Described and Illustrated (2nd ed.). London: John Weale. pp. 292–301. OCLC 833076248. Wikimedia Commons has media related to London and South Western Railway.